While Packard is one of America’s most celebrated automobile manufacturers, the trials and tribulations of the post-war period threatened their previously impeccable image. Packard’s gradual decline in the marketplace could be attributed numerous factors, including clumsy management, and unbearable competition from the Big Tree of GM, Ford, and Chrysler. The Big Three grew even more powerful during the war, making conditions particularly harsh when independent manufacturers made the switch back to civilian production. Gradually, the independents began to falter, turning to mergers and partnerships in hopes of staying afloat. Hudson and Nash merged to create AMC, Kaiser Motors and Willys-Overland joined forces to become Kaiser Jeep, and even the two most influential and longest-running American independents, Studebaker and Packard, would be forced sit down at the table to forge a partnership. The idea was that Packard would benefit from Studebaker’s extensive dealer network, and Studebaker could take advantage of Packard’s cash reserves. 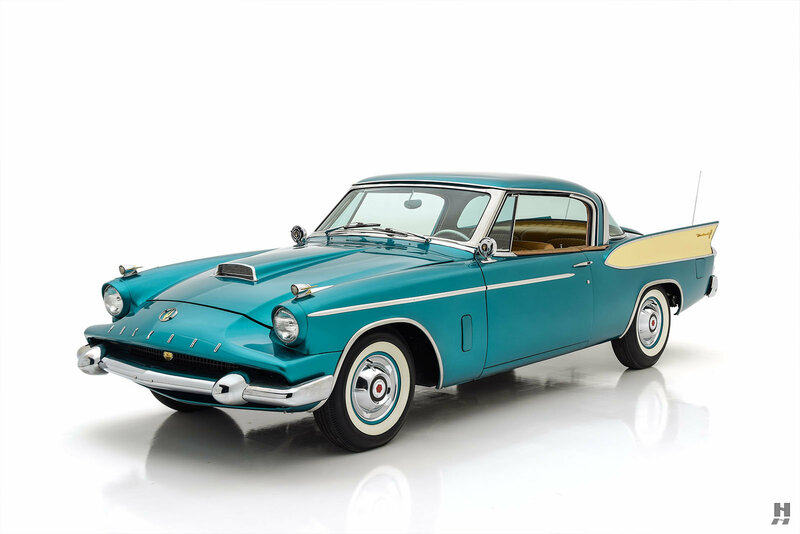 Unfortunately, Studebaker executives weren’t exactly forthcoming with their actual sales figures, and the partnership began to fray almost from the onset. Despite their struggles, Packard continued to develop high-quality cars that lived up to the illustrious brand. When the heavily-revised lineup and new V8 engine debuted in 1955, Packard saw sales jump to 70,000 units, proof that buyers still held the name in high regard. However, the cost of development, tooling, and updates to the assembly plant had the red ink flowing like a river. Even with a move from the iconic but inefficient East Grand Boulevard plant to a former Chrysler Plant at Conner Avenue, the losses continued. 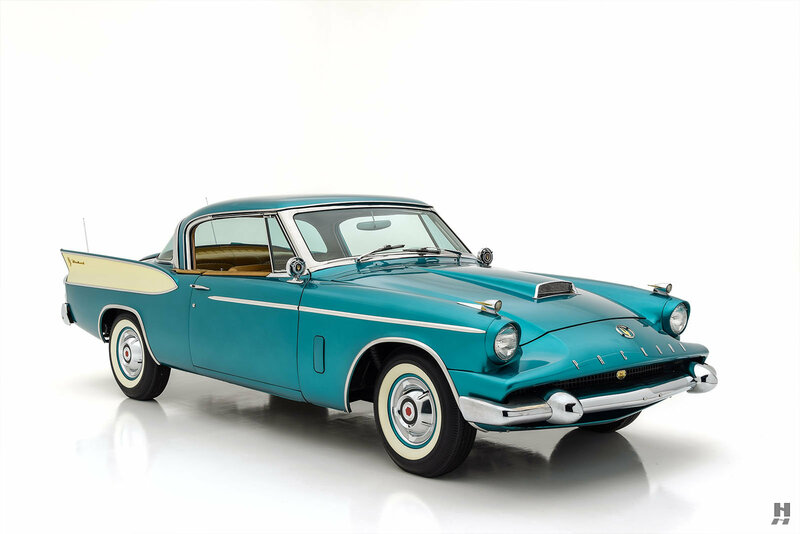 Parts and engineering sharing between the two brands steadily increased, and by 1957, all new Packards were built in Studebaker’s South Bend, Indiana plant, based on heavily reworked Studebaker platforms. By 1958, the legendary Packard name would be in its final year. For the most part, traditional Packard customers were unimpressed with the so-called “Packardbakers.” However, there was a notable exception in the sporty Hawk: A European-inspired four-seat GT car with dramatic styling and a surprisingly potent drivetrain. Built to take on the likes of the Ford Thunderbird, the car shared the same platform as the Studebaker Golden Hawk, though the Packard had a unique fiberglass front end treatment, new bumpers, and more luxurious accommodations. Standard on all Packard Hawks was the compact and powerful 289 cubic-inch Studebaker V8 with a large McCulluch (Paxton) supercharger. 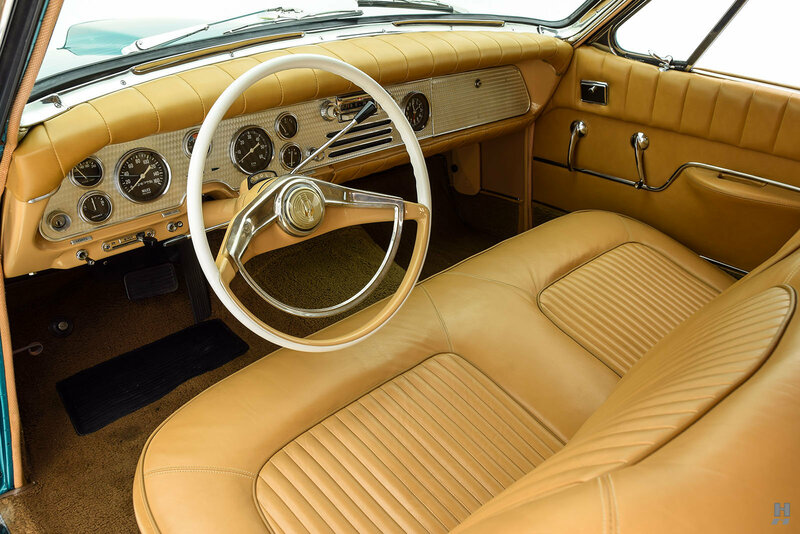 Nearly all of the Packard Hawks came equipped with a three-speed Borg-Warner automatic transmission and the Twin Traction limited slip differential. Along with its Studebaker stablemate, the 275 horsepower Packard Hawk was the fastest four-seat car in America, could handily out-accelerate a Thunderbird, and hang with the Corvette. Despite the flashy looks and surprising performance, it was all too little, too late, and after only 588 Hawks left the South Bend plant, the Packard name was gone for good. 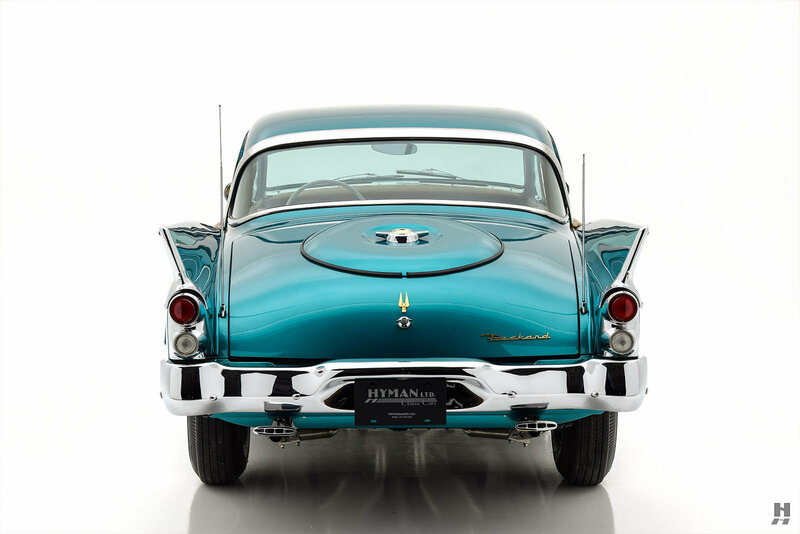 Resplendent in its Mountain Blue metallic paint with signature gold Mylar fins, this 1958 Packard Hawk is an outstanding example of Packard’s swansong grand tourer. This car is number 266 of 588 built and was recently part of the extensive collection of a dedicated Packard enthusiast and restorer. It is rare to encounter a Packard Hawk so nicely restored, and this beautiful example loses none of its original drama. It wears an older but beautifully preserved, ground-up restoration that took the previous owner six years to complete. Lovely metallic paintwork is in very good condition, with smooth, glossy finishes and good bodywork. Much of the chrome trim is unique to the Packard models, including the bumpers and wheel covers, which were designed to make the car look as low as possible. This car’s brightwork is in attractive condition overall, showing some minor polish marks, as well as some fading on the front bumper. 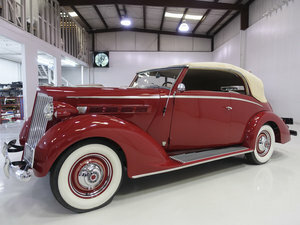 It features dual antennas, wide whitewall tires, correct Packard wheel covers, and dual Packard-Hawk outside mirrors. Flashes of gold trim and emblems mirror the gold applique on the dramatic tail fins. 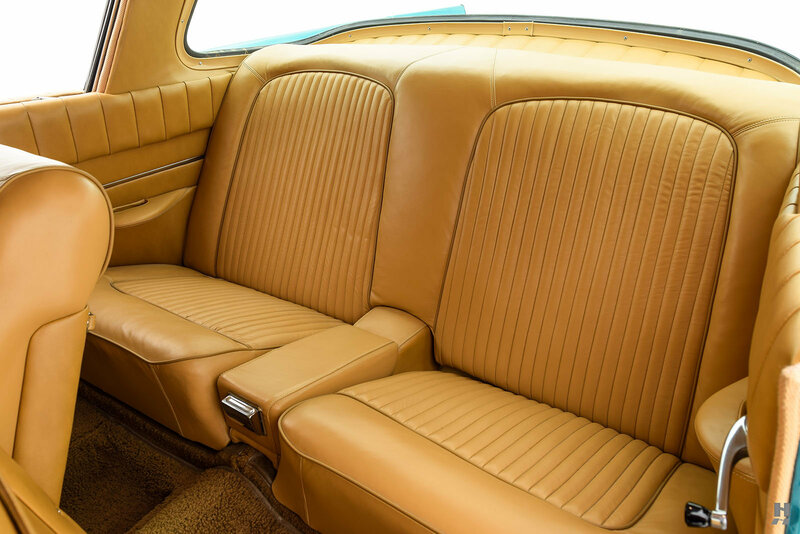 Stepping up from the Studebaker’s vinyl-only upholstery, Packard Hawks received high-quality leather interiors. Also unique to the Packard are quilted armrests applied to the tops of the doors and quarter panels. This car’s tan interior is excellent, with attractive leather upholstery, tidy nylon loop carpets, and superb detailing. The engine-turned aluminum instrument panel is sporty and evocative, fitted from new with race-inspired Stewart-Warner instruments. 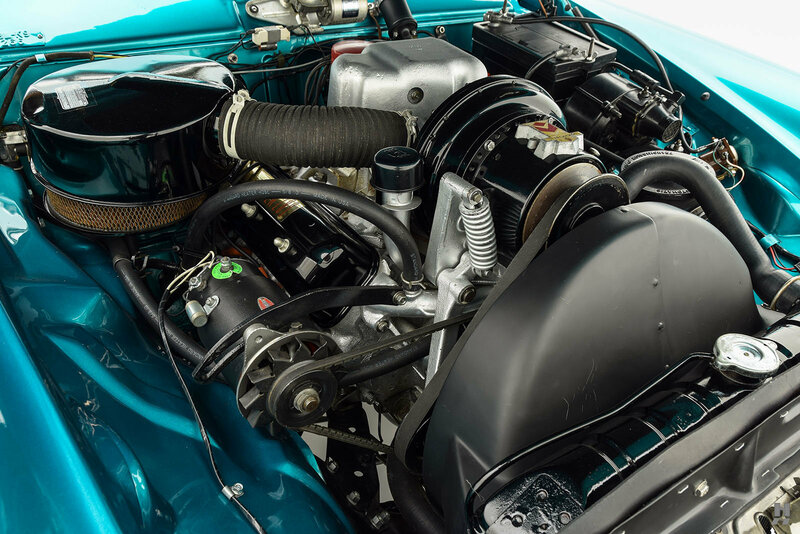 Studebaker’s 289 cubic inch V8 held an advantage over the 352 Packard V8 in that is was lighter, smaller, and when equipped with the Paxton supercharger, more powerful. In keeping with the rest of this car, the engine presentation is tidy and attractive, with excellent painted fittings and accessories, many correct decals and labels, and only slight signs of use. This car is nicely equipped with the Borg-Warner Flight-O-Matic transmission, power brakes, and power steering, to ensure effortless high-speed cruising ability. Since its restoration, this wonderful and rare Packard Hawk was shown in numerous club events and concours. 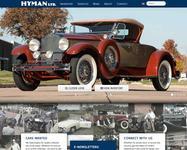 It earned an AACA National First Prize in 2001, as well as a Packard Automobile Classics National First Place. It won an Award of Excellence at the 2000 Greenwich Concours d’Elegance, was shown at the prestigious Amelia Island Concours d’Elegance, and earned a Best in Show at the 2000 Eastern Packard Club annual meet. The restoration has mellowed gently with time, and it remains in highly attractive condition. Misunderstood in its day, the Packard Hawk has gained newfound appreciation with today’s collectors for its unique looks and surprisingly brisk performance. This is a marvelous opportunity to acquire an enjoyable, attractive example of Packard’s dramatic swan song.